I woke this morning to a frosted world. Each tree branch etched in silver. The ground frozen to a solid rock. My breath made plumes of white air. Snowflakes danced on the air.The hens shivered by the backdoor, but the ducks are imprevious to the cold and went for a bath in the stream, quacking their heads off. The sky is trying to snow, but whether or not, it actually arrives is another matter. Yesterday was fraught. Tuppence, one of our cats had to be taken to the vet. For awhile she has had a cloudy eye. In my way, i was sure it was a cataract. However, it had grown and weeping. The vet was kind in that she said evein if I havetaken Tuppence earlier, the outcome would have still been the same. They took her in and she had an immediate operation as the vet was uncertain if she had a brain tumour. Unlike they usually do, I was not premitted to pre-pay. They would give me the bill after the operation, although I did get an estimate. The nurse looked kindly at me. Driving home I disolved in tears. Tuppence has been a part of our lives for nearly 14 years. To make matters worse, the electricity was out at the vets and so I was unable to call and discover how she was. MainlyI shivered under blankets and read. Then finally the vet called to say she had made it through and it was just the glaucoma. No tumour. My dh brought her home. Immediately she demanded food, which is a good sign. And as she is fit and well in everything else, she should recover quickly. At the moment, she is sleeping in the airing cupboard. The other animals won't go near her until the smell of the operation vanishes. But no doubt, she will be out and about soon. On Friday,Christopher Lloyd died. Some of you may not know the name, but he was one of the most influential English gardeners of the late 20th century. In 1996, he was pretty much responsible for sweeping away the silvers and pastels and replacing with them with canna, dahlias and other bold plants. His books and his weekly column in Country Life influenced a generation of gardeners , including my dh and me. Although I came to The Well tempered Garden only in 1993, it was at a time when I was first beginning to become serious about my gardening. I had done the beginning bits, and was hungry to know more. Christopher Lloyd with his no nonsense approach helped. Except the pruning of clematis, do things when you are thinking about them -- whether it is the correct time of the year or not. He made me want to learn about plants. He also made think of walls as spaces to be covered. in 2001, we were down in East Sussex and had the great good fortune to go through Great Dixter. A hot, dusty afternoon. The shadows were lengthening and the garden was shown off to perfection. We lingered a bit and could hear the yapping of his dogs. The middle and I went around the house -- a very cleverly restored manor house. His mother, a woman of great purpose, had insisted all her children learn needlework. On several chairs were pillows that Mr Lloyd had done. His study smelt of wood smoke and there was a jumble of papers,and books. A winged chair was drawn up in front of the huge inglenook fireplace. When we returned home to Northumberland, my dh was inspired. We now have a collection of cannas, a hot border and sculpted holly dotted about the place. Although at one point, the holly tree near the beehives had rather a phallic look to it.... It now resembles a column with a bird on top. Like Rosemary Verey who was another great influence, I am very pleased to have gone to Great Dixter while he was still alive and his personality was still very much in the place. I do hope Fergus Garret, his brilliant head gardener, does continue his legacy of innovation and experimentation, and the garden is not just put in aspic. At least he established a charitable trust. The last of triumverate gardeners that I love is Beth Chatto. Her garden near Colchester is certainly worth a visit. In fact when we went, I ended up sitting on luggage so we could take all the unusual plants we'd purchased home. It is such an excellent cover. It's my birthday. So I am having a quiet day. I have had my cake -- carrot with cream cheese icing. The younger two helped make it, and then fought over who was going to ice it. The younger one by getting up early did most of it. And a very fine job he did of it as well. The middle put the candles on in such a fashion, it was nearly impossible to blow them all out in one go. Luckily I have big lungs. The eldest had made and designed the card. Under my dh's orders, this was hand done -- not on the computer. We then had the cake for breakfast -- an old and established tradition as then we are altogether. 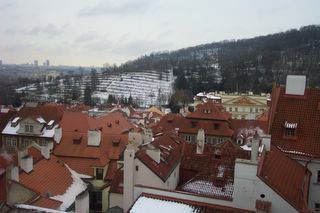 No presents to open because my main present was Prague. It feel quite nice to collect cities for my birthday. The last two years were Rome. My dh is making noises about Budapest for next year. The wip is moving right along. Not as much as I hoped but certainy more than I had done the several weeks previously. It is at a point that I am positive I will have this finished by the first week of Feb. Then all that will remain is the polishing when (thinking positively here) my editors ask to see the full. I have now finished Regency Buck -- another of my favourite Georgette Heyer's. Wonderful hero. Yes, one could say arrogant, but that is in part because the heroine refuses to listen. At times, she needs to be saved from herself. I also lovedthe way Georgette Heyer used little expressions to show that the hero was in fact very intersted in the heroine.Very subtly done. I also enjoyed the enormous amount of period detail, but at times the descriptions of the dresses, shoes, hats and other pieces of attire was Too Much. There was also a wonderful reference to Hatchard's and its bow windows, windows which are still there. I adore the haphardness of the shop, the little rooms, going up and up until you reach the children's section. RB has also given me an idea for a Roman which I think could work very well. So the total for possible Romans after this one goes up to five definate ideas. The main thing is, of course, to wait and see how the first one is received. The publication date keeps getting closer...a somewhat terrifying thought. I should be an old hand at this, considering The Lady Soldier last year, but it all feels new. I saw on Amazon that some kind soul has purchased a copy of Gladiator's Honour in paperback. A huge thank you from me. I will admit to waking up at nights, worrying that no one will buy...Yes, I do know people get M&B Historicals on subscription and certain sales are inevitable, but at 2 o'clock in the morning, such logical considerations go out the window. I have finished Devil'sCub and have gone on to Regency Buck which features another rather wondrful hero -- Julian St John Audley. But I wanted to say something more about the Devil's Cub -- Marquis ofVidal, Dominic Alastair. On the face oof it, a murderer, gambler and thoroughly bad sort with women would seem to be a moral reprehensible hero, repugnant, and yet in Georgette Heyer's capable hands, the reader falls in love with him in an instant. Why? The secret is in the execution. The reader first meets Vidal when his coach is waylaided by highway men. Rather than surrender his valuables, he warns and then shoots one through the pocket of his great coat. With sangfroid, he continues on to the drum and encounters his aunt. Yes, he has killed a man, but in self defence. This gives the reader some inklings as to his heroic nature. Later when he is trying to seduce Sophia's Mary's foolish but beautiful sister, he whispers that he never cheats at cards or a t love and that he has dishonourable intentions to her. He is most emphatically NOT playing her false. She may choose to disbelieve him, but he has has told the truth. Vidal does not lie.Georgette Heyer also goes out of her way to show that Vidal and Sophia are NOT in love. Mary in the early part of the book is much more attracted to Vidal than Sophia is. Sophia is seeking to use him as a means to an end. Later when he is accused of cheating, and is also drunk, because of the hints Georgette Heyer has used, his actions seem acceptable. he is acting by his code. He did not seek the duel. He has already made a wager about how fast he can drive, and therefore feels honour bound to complete that. Equally when he discovers he has ruined Mary's reputation and that she is a virtuous, he offers to marry her. She had no idea he meant dishonourable things, so he feels honour bound to marry her. Her refusal to go along with his plans despite her love and attraction for him sets up the second half of the story. Yes, Vidal is a rake. But Georgette Heyer presents him in such a way that he is always shown as being self-posessed, that he keeps to his code of strict morals, he is mature and not given to introspection. he does not worry why he did things. Julian is another sort of hero who would be easy to dislike, if not presented properly, but I will save him for another time. It should be noted that neither Mary Challoner nor Judith taverner areweak willed women, given to vapours. A strong man needs a strong woman. The key imho is the careful ground work Georgette Heyr lays. It is all in the execution. I have managed to borrow a fe w of Georgette Heyer's, ostenisbly for research as I am probably writing a Regency after my current wip. I am still up in the air on this one and will probably speak to my editor about it. Basically if the Roman series goes well, I want to write more Rome but there again I know Regency does well and it could be useful to increase one's profile. A decision for a later date. Anyway, the Heyers have jumped the list in my TBR pile -- for obvious reasons. I loved them when i last read them about 20 years ago and wanted to know if they were still just as good. Still I am able to read it like a story and to take a trip down memory lane. Vidal is a wonderful hero, but he is not ambigous. Thereader first meets him dispatching a highwayman with great aplomb. Heyer makes him appear a hero, even though later he does several unhero like things. If you haven't it recently, it is a great read and master class in how to make a rake, a sympethic and appealling hero. 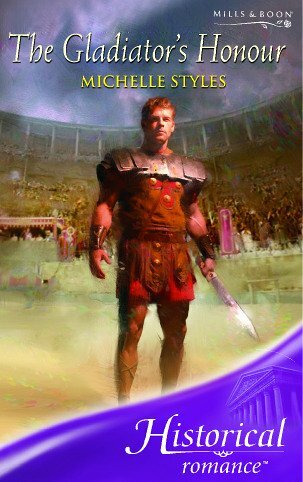 I received permission today, so there is now an extract from The Gladiator's Honour on my website. I still don't have a clear enough photo of the cover yet, but as soon as I get one, I will post it on the website. I decided to check Amazon.co.uk to see if the hardback of Gladiator's Honour had its cover up yet. No, but the paperback version is listed as well as the audio cd! I had no idea that Gladiaotr's Honour was going to be an audio cd. Wow! I checked with my editor. It is no mistake. She was simply waiting for the clearance from Marketing to tell me the good news. Well Amazon beat her to it, but it no less welcome for it. Marketing have yet to reveal who the reader will be, but I don't care. I am sure whoever reads it will do a good job. Mills and Boon are test marketing audio cds at the moment. I think it is a good idea as lots of people listen to books on the way to work, or when they are working out. Anyway, I hope it succeeds. Today in the US it is a national holiday to clebrate the life of Martin Luther King Jr. He is a fgure I admire enormously, but each time this day rolls around, it is not what I remember. Instead I remember the first national holiday back in 1982. Iwas working as a Candy Striper volunteering in the emergency room. For some reason, I was working on a monday, normally I worked on a Friday. Candy Stripers were only allowed to work in Emergency 4-6pm as it was normally quiet and all you had to do was make beds. That night it was bedlam. The worst case was a young girl who had been left home alone by her parents as they both worked. She was about 11. The girl and a friend polished off a quart of vodka. Her parents had found her collasped. If I close my eyes I can still see them sitting with her orange library card in their hands, trying to make sense of it as the doctors worked to save her life. 'She's a good kid,' her father said over and over. One of the nurses who was a friend explained it was why she hated new holidays -- always, always there were problems. That shift was probably the busiest I saw. Someone else had over dosed on drugs and I had to help clean the room up, a minor car crash with a drunken woman, and all the time, there was this child in surgery and her parents softly crying. Kate Hardy had this on her blog and nominated me. And as it is time wasting, I did it. 7 It’s not a problem. I have the time. It will get done. I have been working on my latest. The one which seems to be taking forever. This is probably because I am an impatient person at times. I want to get it finished but because my life last autumn, it did not get finished. Now, having submitted the partial, I have every incentive to get it finished but it is still going slowly. Or perhaps not that slowly as I have been editting the first eight chapters. I have to write acomplete new chapter nine and ten, though. But they will be much better and are needed to move the story forward. And this way will be much stronger, even if the story did hang together the other way. This way, the turning points are coming from either the hero or the heroine rather than being imposed by a third character. The frustration of not being able to drive is also getting to me. My dh casually siad -- oh just go do such and such, and then I had to explain that I couldn't go the middle's parent-teacher conference, couldn't drive in and get the dog food, etc. Funny how things become much less urgent when he has to do them. Next Friday, I should get the all clear to drive....until I have the next operation. Yesterday, sent the partial of my new wip off. I no longer had any excuse -- I had received the comments on TSD, and had been able to revise PBB by extrapolating the comments out. Equally both my critque partners had read it. My editor kindly emailed back that she had it and would look it as soon as she could. Soon in editorial speak is a relative term. At least I know both are on her desk and she is aware of them. Now all I have to do is finish the rest of the wip, in antcipation. When I was in Prague, all sorts of thoughts occured to me on how to make the wip stronger. The solution I came up to some of the problems, I think will make it stronger but does involve a bit of a re-write. I did incorporate the solution into the synopsis that I sent my editor if that makes any sense. My focus had started to stray from the main plot. It is far better to do the work now, rather than wait, biting fingernails for the response to come back after I submit. 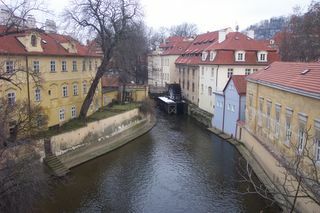 One thing I forgot to say about Prague was the old way houses were identified -- through statues or mosaics on the walls. So you have things like At the Sign of the Black Star, at the sign of the Bull or At the sign of the three ostriches. Very Middle Earth I thought. The broding castle, the winding streets and the at the signs of... Equally the fact that Rudolphll invited a number of alchemists to try to turn lead into gold, including people like John Dee and DrFaustus (before he sold his soul to the devil). The decisive battle of the White Mountain did away with the Winter King. The Winter queen was an English princess and the Legends and Lore of England book my dh gave me for Christmas has several legends connected with her. Also Prague was where Rabbi Low invented the Golem. Golems seem to be gaining in popularity these days. Terry Pratchetts uses them as did Jonathon Stroud in his book -- In the Golem's Eye. At the moment I am reading Tom Holland's latest, Persian Fire, about the clash between the Persians and the Greeks. It too reads almost like a fantasy. There again, it is nearly impossible to re-create the ancient world without making certain leaps as much is shrouded, hidden or lost. Anyway, it is a tale with Magi, Zoasterians, strange gods and mythical happenings to give potents of the future -- usually to justify some action or another. Fascinating reading. Prague is very olde worlde Europeon. How as a child I had always imagined central Europe would be like. It also looks like how I would imgine many fantasy medieval settings would be like -- brooding castle, winding streets, little lanes fulls of shops, cobblestoned streets and a dusting of snow. Old fashioned red and white trams trundle up and down. It is easy to get lost. Each street winds to something more interesting -- another onion domed church, a former gateway, the theatre where DonGiovanni was first preformed -- minutes after Mozart completed it, a marionette shop with fantastical witches and wizards hanging in the window, another shop full of wooden toys. Many of jewellry shops are piled high with amber and Bohemian garnets. The amount of amber is staggering, particularly as it was so prized in ancient times. We stayed at the Hotel Paris, a restored Art Nouveau hotel and a national landmark. It is a truly special hotel if you like Art nouveau as I do. The dining room is all mirrors, turquoise mosiac, bronze and light. In the evening a piano plays, and we kept stopping our conversations to guess the tune. The staff are attentive without being fawning. The food is delicious -- although the dumplings are best left on the side as they are pure stodge. The road to the castle is steep and winding. The guidebooks suggest taking the metro, but we walked, taking in St Nicolas church where Mozart played the organ in 1787. It is an excellent example of High Baroque -- all gilding, statues and frescoes. The guards outside the castle complex wear dark blue uniforms and white fur hats, apparently designed by the same costume designer who did the costumes for Amadeus. St vitus has impressive stain glass, including a window by Mucha. At the Old Royal Palace, the Vladislav Hall is huge with a vaulted ceiling, and a polished oak floor. It used to be used for indoor jousting. You leave by the riding stairs, a gently slooping stone staircase where knights rode the horses up to join the joust. Goolden Lane is full of tiny doll house like shops. Kafka wrote The Caastle here. The name reputably comes from the alchemist toiling away to turn lead into gold during Rudolph ll time, but my blue guidebook says that this is just astory. It is was where the goldsmiths worked under the watchful eyes of the palace guards. It reminded me of Prtmerion in wales -- very staged. For some reason my dh decided the boys should have a genuine Soviet hat, so we went in search of a miltary antique shop. Stillettos were in the window, Nazi belt buckles on a shelf, to one side hung a dark brown leather coat such as someone in the secret service might wear. A haze of blue smoke hung over the shop and two men were arguing loudly in a mixture of Czech andRussin. We backed away slowly. Back on to the streets where shoppers scurried, Christmas lights twinkled and cars zoomed past. On Thursday we explored the Old Jewish quarter -- a harrowing experience. There was a memorial to all the Jewish people from the area who did not return after WW2. Over 77,000 people were sent off to concentration camps, approx 10,000 survived. Of the 10,000 children, only 242 returned. They had a display of drawings the children had made in the Trezin camp, very moving -- pictures of home, dreams of the future, and the names and what happened to them. I was close to tears. I had not realised exactly how small Jewish ghettos were. It must have teeemed with life once. Now it is full of tourists, looking. After that we climbed the hill once again this time to the Loreto -- a place of Catholic pilgrimage as it contains a replica of the Santa Casa -- the supposed house where Mary had a visit from the Angel Gabriel. Apparently the orinal is in Italy having been moved one night by angels to escape the infidels. Or so they say. The treasury had some fabulous pieces all covered in pearls, coral and diamonds. The Prague star contains 6,300 diamonds from Princess Ludmila's wedding dress. Thedress ornially had 6,500 diamonds but the craftsman took the others as payment. Stunning to look at. On the Friday we walked around the National Museum, looking at the Natural History collection. Then we went to the Crypt of SS Cyril and Methodius. In 1942, the Czech parachutists who assignated Heyrich, the architect of the Nazi's final solution, made their last stand there after they were betrayed by a fellow restiance fighter. The bullet holes are still in the walls. The Czech made a valiant stand, holding out for a few days. They tried to dig for the sewers but failed. The inside of the crypt has wreaths of poppies, ribbons with Czech colours and moving tributes to the men's bravery. As a result of the assignation, over 5,00 people died. But the Czech considered it a small price to pay to get rid of the Hangman of Prague. In the evening we saw a production of Mozart's The Magic Flute at the State Opera. Beautifully sung. Cream with gold. Three tiers of boxes lined the teatre, the boxes were a deep red. A real treat for my eyes and ears and a fantastic finish to the trip. My New Year was uneventful. My writing resolutions include writing three brand new manuscripts, not including the half finished one which I am currently working on/The plan is to have this one finished by the end of Jan. 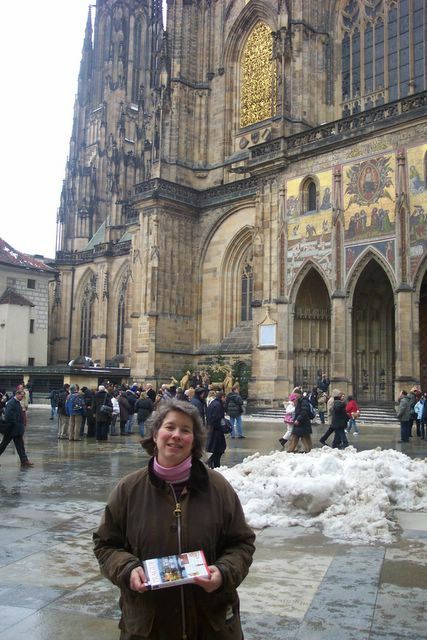 There will be another short hiatus as I am off to Prague. Ok, yes I know it is currently the coldest place inEurope...but it should be fun and it is still the Winter Festival.